The moment I tell people I quit sugar nearly two years ago, they gasp at the thought of living sugar free. Yet, when I whip up a pudding or dessert, there is an equal gasp at how yummy it is. 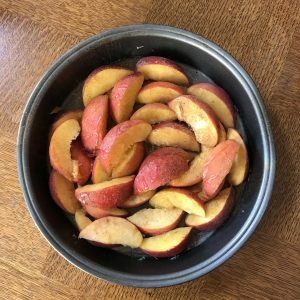 In this quick and easy peach crumble recipe, there are alternatives for different levels of sweetness. I also use gluten free oats, because gluten and sugar are very much linked. 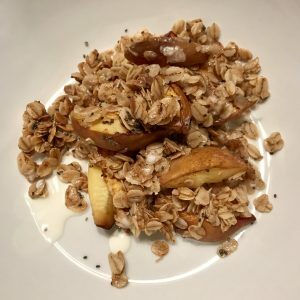 I will leave that to the experts to explain, so check out Sarah Wilson‘s blog post on Why I quit gluten when I quit Sugar. Cut the peaches off the pip into eight pieces per peach. In a small shallow baking pan, place the peaches around in a circle until the pan is full. Drizzle your choice of sweeter. For sugar free, rice syrup is the only option. It is less sweet, so if you are not so fussy go for the honey or maple syrup, which adds sweetness. Sprinkle the mixed spice or cinnamon and bake in a pre heated over on 180 deg c. for 20 mins. Just before the time ends, melt the coconut oil on low heat in a pan. Add the sweetner of choice and let it get hot. 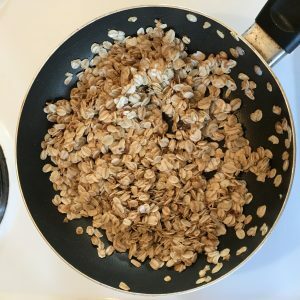 Throw in the oats and stir continuously until they go golden brown. Don’t take your eye off it because once it’s ready, it go brown quickly. Remove the pan from the oven and evenly spread the oats, then sprinkle the chai seeds and return to the oven for an additional 20 minutes. Serve hot and if you are eating dairy, pour on some cream. For the vegan/diary free alternative, use coconut milk.